Time for another edition of Picking Their Brains! 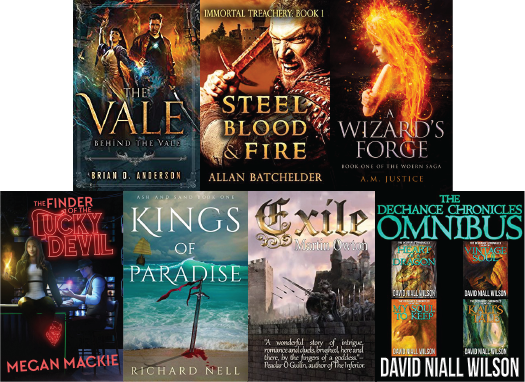 Each month I ask a group of fantasy authors for their advice on various topics, and this month we're discussing marketing. Most authors will tell you how important and time-consuming marketing can be, but how do you make the most of your time? Here are several tips for effective strategies from experienced authors and reviewers. Don't be too eager to click the publish icon. Spend time becoming a part of the community. Expand your reach through networking. And whatever you do, don't spam your book. Once you are established as a member of the groups, then start a buzz about the release. Be careful not to come on too strong. This a can takes months. But it's worth it in the long term. You get one chance to make the first impression on a reader. So be sure it's ready. Did you have it edited? Proof read? Beta tested? Is your cover striking? Is the blurb catchy? Basically, can it stand up to the top authors in your genre? If not, don't publish. You're not ready yet. I mean, you can. But don't expect good results. Okay, here it is: it doesn't matter if you like or use LinkedIn, Snapchat, Tumblr, Pinterest, Instagram, YouTube, Goodreads, etc., etc., etc. You MUST use them. You've got to establish as many connections in the world-wide-web as possible, to increase your chances of being found. People should find your name and then your book everywhere they look. They need to be constantly reminded of what you have to offer. And if you don't make that effort, how can you expect your potential readers to? Brand yourself. Create something interesting and then go with it. Network, network, network. Join social media groups related to your genre and contribute to discussions of topics you enjoy, while keeping your comments and interactions courteous and respectful. Build your network of supporters this way. It takes time, but these relationships will be vital to advancing your career later. This, twice over. Be nice, be interesting, be helpful. Offer advice where you have expertise. Do people favors and hope that they will be returned, they probably will be since, by and large, writers are decent people. Your next book is the best marketing. Experiment. Try new platforms, try new ads, read books on indie marketing until you can't stomach it anymore. Take all advice with a grain of salt but don't just throw it away either. Keep a calendar of what you'll try and keep notes on what you did and when. Start building your own data. - Look for books that are similar to yours on Goodreads. Don't approach the very top reviewers as they probably have little time but message reviewers who have 20 or so likes on their posts when they rate the similar books highly. These probably have a blog, twitter etc and when your book might be marketed free across a few platforms then message them and offer them a free copy. It's like everything, you might only get a 15% review rate but it's better than 100% of nothing. - Never pay for a review. Is advice #2. - Do review swaps with authors 10% more popular and less popular than yourself. The scene is very supportive but it's got to be a mix of giving and taking and you have to put the time in. - Be nice. Don't chase up reviewers asking when they will read your book. They get offered many many books but they still do it for the love of literature. If anyone chases me up, and I'm sorry if this is harsh, but they go to the back of the queue. - Be active on forums such as this, Fantasy Faction and Grimdark Readers and Writers. Never plug your book in a post but write interesting things and regularly about the often interesting topic and people will look you up and interesting minds might equate to interesting reading material. Please stop comparing your book to ASOAIF, WOT or any other major series. Especially if it’s not of the same genre. This is easy. When deciding whether or not to spend money on a promotion, ask the promoter for more than just a list of people saying "golly gee I promote ALL my books through yadabook.com" - if they can't show a probable result (Bookbub, for instance, has a chart with expected downloads / sales depending on genre and price-point). A large number of people to e-mail something to does not equate to a large number of people who actually buy books. Most promo sites promote to lists of fake accounts and several thousand other hopeful authors. Do have a professional cover. Do have your book professionally edited. Do offer great content, sales, giveaways, incentives when it comes to sharing your social media or website links. Do request reviews and then share the blogger's links. Bloggers love when you share their reviews! Do treat people like people. Be friendly, responsive, and patient. If a reviewer doesn't have time to read your book, ask if you can submit a guest article or interview. Do share other authors' books who have a similar audience. Do figure out AMS ads because they work when you take the time to learn the optimal settings. Do review books in your genre. This is a great way to get noticed and for readers to get a sense of your taste. Don't spam sites or threads with links to your book. Don't assume the worst in people. Everyone is busy. Just because they don't always interact with your social media, don't take it personally.